Human Science is the term coined by the us at IADLife, which is defined as the area of study in human mind, body, heart and soul by scientists. Our studies and findings are reflected in IADLife sayings and sharings and shared in internal IADLife workshops like T@T6. Healing and Spiritual Workshops comprise of information and discussion on healing solutions for the attendees. These knowledge gained through discussions, courses, workshops from healers, counselors, spiritual leaders are imparted by experts through workshops and training. One on one counselling for individual or couple or family. Various processes and methods are discussed with an expert who suggests and supports from a non judgemental space, to bring to clients the solutions that they need and will be beneficial to them. Testimonials in Interactions contains the interaction during the gratitude practice, which included participants sharing their queries, feedbacks, and experiences, which was a testimonial in itself. I replied to each query clarifying the doubts and acknowledged the comments. This was from the February 2018 participation. Thank you Reena, Rashmi , IADLife and magic Practice group for this journey. I am feeling good in most of the aspects of my life. I am grateful for this magic practice. I would love to continue it further as well. IADLife and Reena are part of my life since few years and all the healing modalities and help I have got and learnt are from Reena and through IADLife. I very grateful for all the support and guidance I have always got. I was doing THE MAGIC practice before too and I am very glad I could do it in a group which was more effective and structured. I could see manifestations happening faster and of course Reena’s reminders have helped a lot to stay on track. Thank you so much for all the love and guidance Reena. Thank you Reena for a wonderful 28 day journey. Even though I didn’t follow or participate 100% I still received many amazing outcomes. In gratitude always. I could feel the negative feelings changing into positives. When I thanked my self today to be having perseverance, truthfulness and dutiful I realized how harsh I was on myself earlier to this. And started feeling so much happier. I could feel all my cells turn happy. Gratitude paves the way for a happier brighter tomorrow. Those who practise gratitude will not face an impasse in life. Reena thank you for making the practice of gratitude structured in my life. Thank you thank you thank you. Am thankful to reena for introducing this gratitude practice,Thank you,thank you,thank you. During this practice,my daughter’s exams were going,I showed gratitude towards my daughter for she being my daughter and I said thank you,after that I saw something changed my feelings with me such that I was not getting anger towards her.v both had a very nice time preparing for exams.Thank you,thank you,thank you. During exams I even told my daughter to show gratitude towards the books,her teacher’s and everyone who had helped her,she did ,I found out that after this the results what was expected was amazing,thank you reena,thank you thank you. Thanks Reena for creating this whatsapp event. I have written gratitude for simplest things which I (and many) can take it for granted. But then next moment or next day certain magical things happened that I can’t stop writing in my gratitude notes. I used to get interview calls. I know I am looking for something better than what that opportunity is offering. But I went and wrote thanks in my book for giving me that opportunity. But while writing I wished what if I get a similar interview call letter from my dream companies. And next day I started getting calls from my dream companies. Like was in many areas of my life I am seeing changes. And also I am doing certain online courses which are tough to complete. Then I started writing thanks atleast for 1 hour I could go through the course and learnt something. Like was for every next successful hour I wrote thanks. And I could complete few of my courses successfully. Now I am thankful that I gained more knowledge after all completion which can attract more better opportunities for me. Every small thing when we appreciate it will create bigger bigger and better things in our life’s. That what I understood through this process. The ocean is made up of tiny droplets of water. Thank you Reena for putting us all in a positive frame of mind n gratitude is helping us stay there. Thank you Reena for this. Whichever day I did it I noticed a big positive shift in myself. But I wasn’t consistent. Will join the new group and start again. Thank you Reena for your wonderful guidance and support to complete the 28 days magic practice. Even though I can’t complete all days with perfection. But i noted all days practice in my dairy and in my mind as I can.surely I will do it. Dear Reena, I enjoyed the session for almost 2 months. 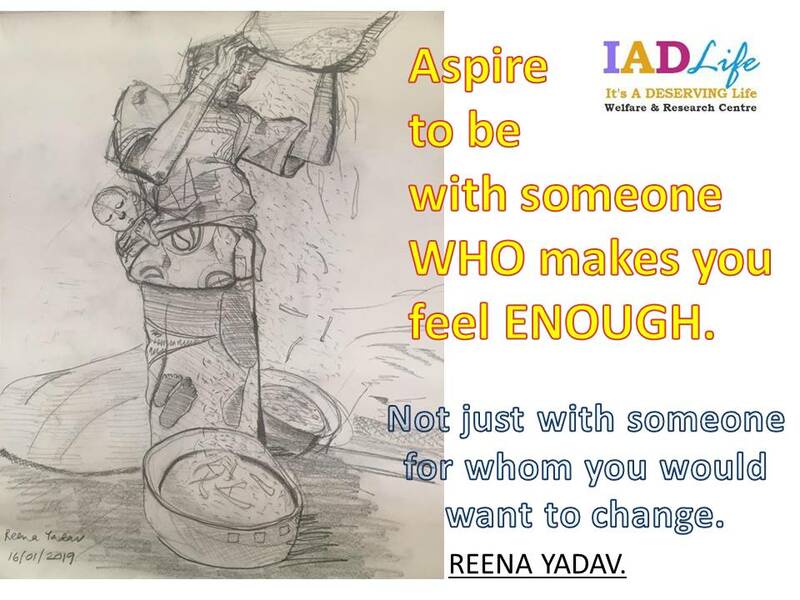 Thank you Reena and IADLife for your effort. I would lke to join this group in future activities. Thank you. And saying thank you is coming so easily.. Like the brain is on autopilot mode. Attract what you expect, Reflect what you desire, Become what you respect, Mirror what you admire.1st item in my desire list got materialised yday. My happiness is changing to a different direction. I am enjoying every moment of gratitude. Could spread positivity. People around me are also changing. Thanks to IADLife and Reena and Usha who introduced me to this. I want to stay hooked to this wonderful Gratitude programme. Thank you, Thank you, Thank you. God bless you all. I want to share something really magical happened. On magic cheque day I was really so lazy to print the cheque so I didn’t. But yesterday I felt like printing few cheques. I printed many but I wrote 3 yday and 3 today. Amounts considerably big. They all got manifested now. I am not going to a job but this amount is with my own effort only and genuine way I got it. Disclaimer: All the viewpoint is of the writer only. All the writings are intended for healing explanations only. Thank you. Copyright: All the data is copyright of IADLife, so please do not copy. If you do need the data then please mention, give credit to IADLife and the content writer. Thank you.